We’d love your help. 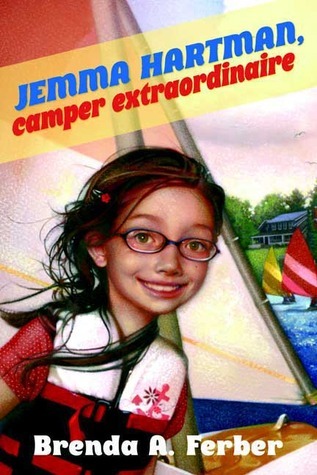 Let us know what’s wrong with this preview of Jemma Hartman, Camper Extraordinaire by Brenda A. Ferber. Jemma Hartman knows that her first summer at beautiful Camp Star Lake is going to be amazing. There will be swimming, sailing, and overnight trips – not to mention her best friend, Tammy, who moved away a year ago. But when Tammy’s cousin, Brooke, decides to come to camp as well, Jemma’s perfect summer starts to crumble. Brooke never laughs at Jemma’s jokes, and she thinks Jemma Hartman knows that her first summer at beautiful Camp Star Lake is going to be amazing. There will be swimming, sailing, and overnight trips – not to mention her best friend, Tammy, who moved away a year ago. But when Tammy’s cousin, Brooke, decides to come to camp as well, Jemma’s perfect summer starts to crumble. Brooke never laughs at Jemma’s jokes, and she thinks she rules the cabin. She even convinces Tammy to be her sailing partner, sticking Jemma with the camp weirdo. Jemma just can’t understand why Tammy wants to spend all her time with Brooke. And is it really possible to make new friends but keep the old, like the song says, or does Jemma simply need to let go? To ask other readers questions about Jemma Hartman, Camper Extraordinaire, please sign up. Jemma is off to summer camp and is excited to see her best friend Tammy, who moved away. They'll have the whole summer to reconnect. Jemma is caught off guard though, when Tammy brings her cousing Brooke with her to camp. Tammy keeps choosing Brooke over Jemma for activities and Jemma is very jelous. An OK coming of age story, about old and new best friends, when to let go, and jelousy feelings. I love this book so much! It makes me less nervous about camp and to know what i am expecting. I love the character (Jemma) and her motivation to do some thing that she thought was still there. She and Tammy had a great bond to be half ruined by Brooke and half ruined by Tammy moving. Delaney also seems like a perfect friend. It sends out a great message! Awesome book. Memorable book on kids' friendship, growing up, and learning to be authentic. The details on camping and sailing are rich reminders of life at summer camp. And the struggle with jealousy is as real as it gets. This is a writer unafraid to share what goes on in the minds of real girls. I did not like that most of this book was taken up by the whining and pining of Jemma over her best friend finding another friend. Jemma's character did not grow until the very last part of the book and I really did not like this irritating protagonist. One Sentence Review: I never went to camp myself, but if I had I'm pretty sure it would have been an experience almost identical to Ferber's amazing little microcosm as it appears within these pages. I enjoyed this book tremendously! The perception of a beginner learning to sail is written so well! The camp experience is also portrayed well. I think any girl from 9 to 14 could relate to this fictional experience and learn from it! Thank you Brenda Ferber! Lots of kids can relate to this story because it is about a girl named Jemma and how her best friend started paying more attention to her own cousin than to the person who has been there for her her whole life (Jemma). This book is full of jealousy and competition. I suggest that you read it. Incredible detail about summer camp and activities. Must have gone back and sailed, spent night in cabins, mess hall, etc. Well-researched. Fun read, and I would recommend it to any camper! I don't think this is something I will read over and over, but it was sweet. It approached changes in friendship well and came to a decent conclusion. My third grade girls will enjoy it, but I found it predictable.